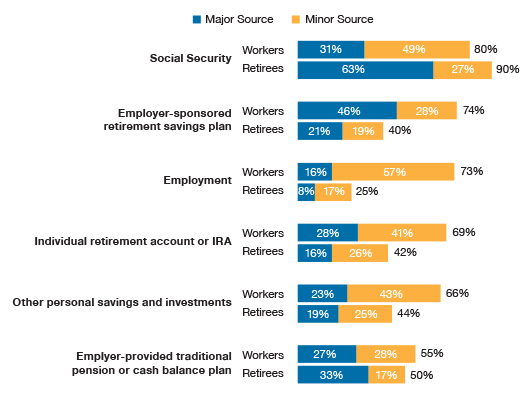 During the past year, one survey found 13% of workers now plan to retire later than they previously expected. Traditional IRAs have been around since 1974. Contributions you make to a traditional IRA may be fully or partially deductible, depending on your individual circumstances. Distributions from a traditional IRA are taxed as ordinary income and, if taken before age 59½, may be subject to a 10% federal income-tax penalty. Generally, once you reach age 70½, you must begin taking required minimum distributions. Well over one-third of workers are eligible to participate in a defined–contribution plan such as a 401(k), 403(b), or 457 plan.³ Eligible workers can set aside a portion of their pre-tax income into an account, which then accumulates tax deferred. Distributions from defined contribution plans are taxed as ordinary income and, if taken before age 59½, may be subject to a 10% federal income-tax penalty. Generally, once you reach age 70½, you must begin taking required minimum distributions. Successful sector investing depends on an individual’s ability to consistently and accurately determine when to rotate in and out of the various sectors, which may be a challenge for most investors. Because of its narrow focus, a sector investing strategy tends to be more volatile than an investment strategy that is diversified across many sectors and companies. Sector investing also is subject to the additional risks that are associated with its particular industry. Sector investing can be adversely affected by political, regulatory, market, or economic developments.